Bristol is one of those companies which excel at certain parts of the market. You could say that they have specialties. Blueridge BD-16 is the result of what happens when Bristol decides to create a balanced yet exciting entry level acoustic. Everything about this guitar is on point, starting from its build quality and all the way to the value it offers. Because of this, and so much more, we had to add this bad boy to your list of recommended beginner acoustics. One thing that is to be expected in this price range is the lack of solid tops and sides. Some find that to be deal breaking flaw, but that would exclude just about every value model in the entry level segment. Blueridge BD-16 features a laminate top, but one that is made right. Laminate wood will never sound as good as solid one, but if done correctly, it can come pretty close. Bristol managed to push this performance to a point where you are getting way more than you’ve bargained for. Tonewood used for the top is standard spruce, while the back and sides are mahogany. This is a pretty sweet combination of hard and soft wood, which delivers interesting results in terms of tone. Neck is also made of mahogany and features a very fast profile. On top of it, you’ll find a standard rosewood fretboard. No thrills to be found, rather a pretty solid foundation. In terms of hardware, you can expect to find just about what is an industry average for guitars in this category. In other words, a very basic rosewood bridge paired with an artificial saddle and nut. On the other end of the neck, at the headstock, Bristol installed a set of standard die cast tuning machines. While the hardware is neither here nor there, everything works pretty well. As long as you are not pushing the guitar too hard with aggressive bends, your tuning should stay more or less intact. As always, the first upgrade that is done to entry level guitars are the tuning machines, so there’s that. Once you start strumming or picking strings, every criticism of this guitars falls into water. 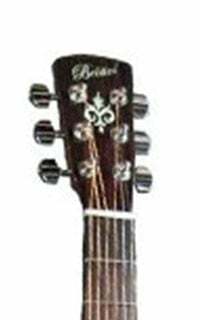 Bristol delivered a guitar which performs outside its price range. Combination of spruce and mahogany gives it a warm, yet vibrant tone which is projected loudly thanks to its dreadnought body shape. There’s clarity, definition, but also wholesomeness in the way this guitar talks. Whether you are a strummer, or someone who prefers finger picking, Blueridge BD-16 doesn’t disappoint. more complicated further down the road. 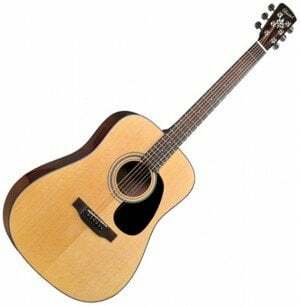 If there’s any acoustic guitar which delivers this type of performance, it’s Blueridge BD-16. It’s simply that awesome. For more info about the Bristol BD-16, click here. For more acoustic guitars for starters, click here.